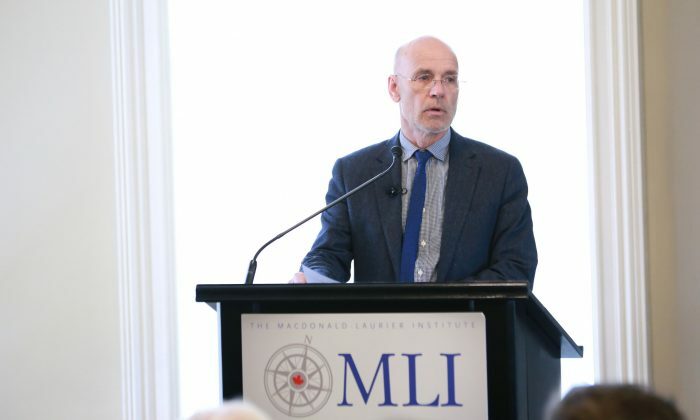 The main threat Hamilton identifies is that Beijing has been working to sway elite opinion, attempting to get decision-makers in Western countries to conform with the Chinese Communist Party’s (CCP) agenda. “The CCP has built a complex network of agencies tasked with exerting influence abroad. The agencies deploy sophisticated techniques to influence, persuade, and coerce others to act in ways approved by Beijing. The techniques have been refined over decades and are far more extensive, intrusive, and secretive than those used by other nations,” he wrote in a commentary. “Canada’s place in the Chinese Communist Party’s strategic map of the world is as important as Australia’s in its own way,” Hamilton added. 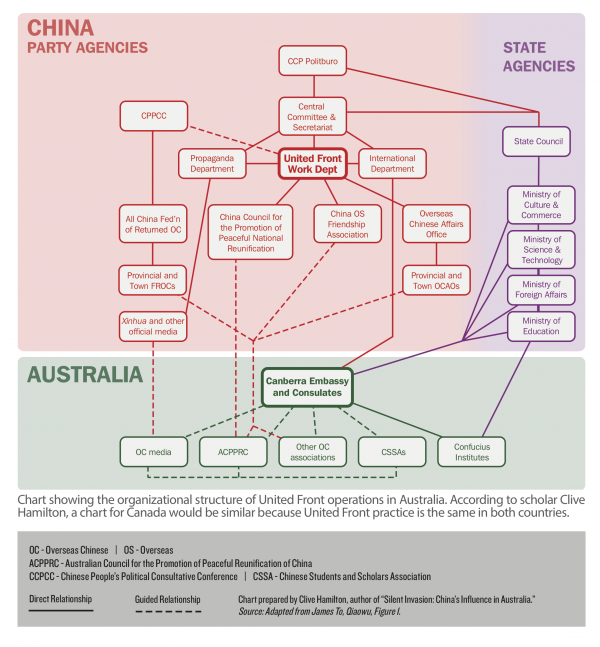 In the chart shown below, Hamilton outlined the organizational structure of China’s United Front Work Department operations in Australia. He says a chart for Canada would be similar because United Front practice is the same in both countries. The United Front has far-reaching tentacles that try to target every aspect of society, from business and cultural organizations to educational institutions, and politics. It works to influence the choices, direction, and loyalties of its targets by overcoming negative perceptions and promoting favourable perceptions of CCP rule in China. The United Front tries to suppress groups in other countries targeted by Beijing, including democracy activists, Taiwan supporters, and Falun Dafa adherents, among others. United Front activities fall under the aegis of the Politburo of the CCP Central Committee. At its heart are four main agencies: Overseas Chinese Affairs Office, China Overseas Friendship Association, China Council for the Promotion of Peaceful National Reunification (CCPPNR), and the All China Federation of Returned Overseas Chinese. The latter is an agency formally of the Chinese People’s Political Consultative Conference (CPPCC), a large political advisory body run by the United Front Work Department. The bottom part of the chart shows how the United Front is set up in Australia. ACPPRC is the overarching vehicle in Australia for coordinating smaller bodies. Hamilton said similar organizations operate in Canada. Overseas Chinese media—at the bottom left—are critical for communicating to the diaspora, fomenting patriotic Chinese feelings, and amplifying official messages. Other overseas Chinese associations include hometown associations, business associations, ethnic Chinese professional and scientific associations, cultural and heritage groups, friendship associations, and alumni associations. The Chinese Students and Scholars Associations (CSSAs) are an integral component of United Front, helping to monitor the thoughts and behaviours of the 178,000 Chinese students on campuses across Australia. “The effect has been that pro-Beijing elements are now seen as representing ‘the Chinese community’ in Australia,” wrote Hamilton. Hamilton added that United Front organizations also encourage their members to enter politics and run for elections for mainstream parties. “The Australian Security Intelligence Organisation (ASIO) was reported last year to have identified about 10 political candidates at state and local government elections whom it believes have close ties to Chinese intelligence services,” Hamilton wrote. Australia has adopted foreign interference laws as a first step to protect against Beijing’s attempts to influence and interfere with Australian politics, while it takes other measures like stricter rules on foreign acquisitions and investments into critical infrastructure—such as 5G telecom networks. Canada is part of a “full-court press of influence operations,” Hamilton added. Where Did American Scholars Go Wrong in Their Study of China?